Lupus nephritis is an immune complex GN that develops as a frequent complication of SLE. The pathogenesis of lupus nephritis involves a variety of pathogenic mechanisms. The extrarenal etiology of systemic lupus is based on multiple combinations of genetic variants that compromise those mechanisms normally assuring immune tolerance to nuclear autoantigens. This loss of tolerance becomes clinically detectable by the presence of antinuclear antibodies. In addition, nucleic acids released from netting or apoptotic neutrophils activate innate and adaptive immunity via viral nucleic acid-specific Toll-like receptors. Therefore, many clinical manifestations of systemic lupus resemble those of viral infection. In lupus, endogenous nuclear particles trigger IFN-α signaling just like viral particles during viral infection. As such, dendritic cells, T helper cells, B cells, and plasma cells all contribute to the aberrant polyclonal autoimmunity. The intrarenal etiology of lupus nephritis involves antibody binding to multiple intrarenal autoantigens rather than the deposition of circulating immune complexes. 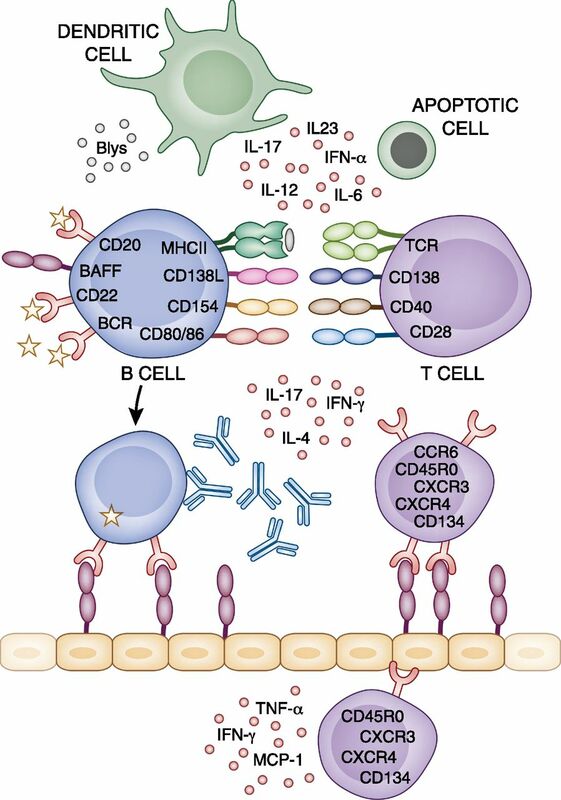 Tertiary lymphoid tissue formation and local antibody production add to intrarenal complement activation as renal immunopathology progresses. Here we provide an update on the pathogenic mechanisms that lead to lupus nephritis and provide the rationale for the latest and novel treatment strategies. SLE is a chronic autoimmune disease characterized by loss of tolerance against nuclear autoantigens, lymphoproliferation, polyclonal autoantibody production, immune complex disease, and multiorgan tissue inflammation.1,2 SLE used to be referred to as a complex autoimmune disease of unknown etiology; however, during the last decade, a multidisciplinary approach to SLE research has built a more concise view of its pathogenesis and for lupus nephritis (LN). Here we briefly summarize an updated working model of SLE and LN, which provides a rationale for novel therapies. SLE develops from a loss of self-tolerance to ubiquitous nuclear autoantigens, which is a result of an immunization process. This observation implies two notions (Figure 1 and Table 1). First, autoreactive, long-lived plasma cells, and memory T cells memorize their immunization against nuclei. These cells cannot be deleted by current immunosuppressive therapies; hence, current treatments may suppress disease activity but do not cure SLE.2,3 Second, the nuclear antigens used for immunization had to be accessible to antigen-presenting cells, a process that is normally avoided by the homeostatic mechanism of rapid dead cell clearance. In fact, SLE develops in individuals with unfortunate combinations of genetic variants that, among other immunoregulatory defects, compromise those mechanisms that normally assure low levels of chromatin in extracellular compartments, particularly mutations that alter apoptosis,4,5 the opsonization of dead cells by complement, or their removal by phagocytes.6 Neutrophils undergo NETosis, which releases nucleosomes into the extracellular extracellular space.7–10 This finding recently revealed an unexpected role of neutrophils in SLE.11 But how do dead cell clearance defects lead to SLE? Pathomechanisms of LN outside the kidney. (A) Genetic variants of homeostatic cell death (i.e., Fas variants) and the rapid clearance of dead cell corpses (e.g., C3/4 variants or DNAses variants) result either in secondary necrosis or incomplete chromatin digestion, which both promote the exposure of nuclear particles to the immune system. (B) Nuclear particles resemble viral particles and activate the same viral nucleic acid recognition receptors on antigen-presenting cells. Genetic variants of those signaling elements are recognized to be risk factors for SLE. The activation of antigen-presenting cells changes (by costimulation) the immune interpretation of concomitantly presented antigens of the same particle. (C) Polyclonal lymphocyte expansion has multiple effects on the disease process and genetic variants further affect the differentiation of T helper cells. The complex regulation of lymphocyte activation and expansion is affected by multiple genetic variants. The susceptibility genes and genes/molecules that are involved within each biologic pathway are listed to the right: C1q, C2, C4A/B, C-reactive protein (CRP), α-glucoside transporter 5 (ATG5), three prime repair exonuclease 1 (TREX1), B cell CLL/lymphoma 2 (Bcl-2), IL-2 receptor α (IL-2Rα), tyrosine-protein kinase receptor 3 (TYRO3), mast/stem cell growth factor (MGF), Fcγ receptor (FcGR), HLA IL-1 receptor–associated kinase (HLA IRAK), IFN regulatory factor (IRF), signal transducer and activator of transcription (STAT), integrin αM (ITGAM), TNF α-induced protein 3 (TNFAIP3), zinc finger protein 36 (Zfp-36), IL-4, IFN-γ, MHCI, MHCII, TNF, TLR7, single Ig and Toll-IL 1 receptor (SIGIRR), B cell scaffold protein with ankyrin repeats 1 (BANK1), B lymphoid tyrosine kinase (BLK), IKAROS family zinc finger 1 (IKZF1), protein tyrosine phosphatase, nonreceptor type 22 (PTPN22), pituitary tumor-transforming 1 (PTTG1), RAS guanyl releasing protein 3 (RASGRP3), TNF (ligand) superfamily, member 4 (TNFSF4), TNFAIP3-interacting protein 1 (TNIP1), transmembrane activator and calcium-modulator and cyclophilin ligand interactor (TACI), BAFF/BLyS, cytotoxic T-lymphocyte antigen 4 (CTLA-4), programmed cell death protein 1 (PD-1/PDCD-1), and Gadd45 (activated by the stress-inducible GADD45). A delay of dead cell removal leads to degeneration of its components, which compromises those elements that normally distinguish self-nucleic acids from viral nucleic acids.12,13 For example, nature developed the methylation of DNA and RNA as a way to inhibit RNA and DNA recognition by Toll-like receptors (TLRs) 3, 7, and 9, a set of endosomal viral nucleic acid recognition receptors that trigger antiviral immunity during viral infection.14 Therefore, in SLE patients, nuclear particles are taken as viral particles that contain some protein component (antigen) as well as some immunostimulatory nucleic acid (immune adjuvant; Figure 1). Therapeutic targets for LN. Aberrant immunity in SLE involves many different cell types and cytokine mediators, which could be suitable therapeutic targets. MCP-1, monocyte chemotactic protein-1; CCR, CC chemokine receptor; CXCR, C-X-C chemokine receptor. Together, SLE develops from a peculiar combination of genetic variants that impair those mechanisms that normally prevent the exposure of nuclear particles to the immune system and their capacity to activate viral recognition nucleic acid receptors (Figure 1). Therefore, an IFN-α–dependent (pseudo)antiviral immune response accounts for those nonspecific SLE symptoms that are shared with viral infections. The autoadjuvant activity of endogenous nucleic acids promotes an adaptive immune response against the components of the nuclear particle, a process identical to vaccination. 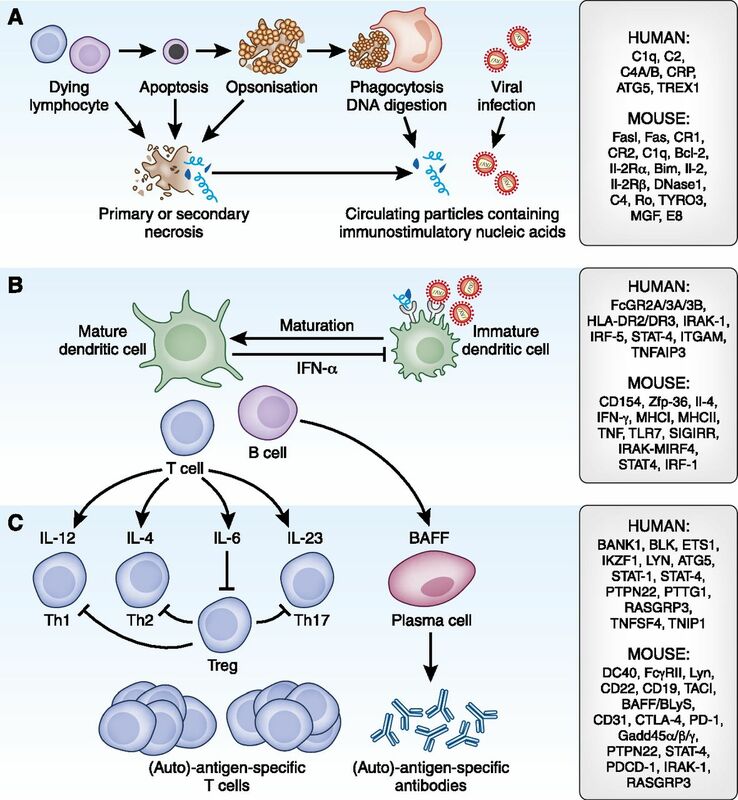 This implies the expansion of T and B cell clones with specificities for predominantly nuclear autoantigens that account for the production of antinuclear antibodies, immune complex disease, and T cell–dependent tissue damage. Hormonal and environmental stimuli can enhance these processes at different levels. The nonspecific activation of autoreactive B cells explains the polyclonal autoantibody response leading to the diagnostic hallmark of LN, the full house pattern of IgM, IgA, and IgG deposits.36 However, antibody-deficient mice still develop LN; therefore, B cells have pathogenic effects beyond antibody production,37 including autoantigen presentation to activate autoreactive T cells and local proinflammatory effects.26 Immune complexes deposit in the mesangium or the subendothelial and subepithelial spaces or in peritubular capillaries depending on the quality of the autoantibodies, the duration, and severity of LN.38 This implies that immune complex formation in the mesangium causes class I and II lesions, subendothelial immune complex formation in class III and IV lesions, and subepithelial immune complexes in class V lesions as well as the overlapping forms III/IV and IV/V.39 The traditional concept that circulating immune complexes in lupus passively deposit in the kidney has been challenged by novel data.40,41 Glomerular immune complexes rather form in situ by secondary binding to nucleosomes from renal cells.42 Another potential intrarenal source of nucleosomes are neutrophils upon NETosis,11 due to the release of neutrophil extracellular traps that is initiated by anti-LL37 antibodies.7–10 Heparin modulates the intrarenal effect of chromatin either by enhancing the DNA-I–dependent chromatin degradation or by preventing chromatin binding to the glomerular basement membrane.43 Anti-DNA antibodies activate endothelial and mesangial cells through different mechanisms. For example, antibodies are directly taken up inside renal cells.41 This process involves cross-reactivity with α-actinin or annexin II on mesangial cells,44,45 but this concept could not be confirmed by recent studies.46,47 In addition, intrarenal immune complex deposits activate complement,36 which demonstrates the dual role of complement factors in LN.48 Complement deficiency impairs opsonization and removal of lupus autoantigens from the extracellular space, whereas complement factors also directly cause immune complex–related renal inflammation and immunopathology.49,50 That immune complexes activate glomerular cells by Fc receptor (FcR) ligation is also well established even though the data accumulated over the last few decades remain complex.51 Subepithelial immune complex deposits lead to secondary membranous GN and nephrotic syndrome by damaging podocytes. Damage to renal parenchymal cells triggers healing responses that contribute to renal pathology. Focal tuft necrosis is followed by a migration of parietal epithelial cells in the glomerular tuft, where they produce extracellular matrix contributing to FSGS progressing to global glomerulosclerosis.79 During this process, the parietal cells maintain their polarized epithelial phenotype and lay down extracellular matrix on top of the podocytes.79 In addition, cellular glomerular crescent formation results from activation of parietal epithelial cells that fill the urinary space by uncoordinated proliferation.80,81 This process can be triggered by glomerular basement membrane breaks that allow plasma leakage into Bowman’s space, where mitogenic plasma components such as fibrinogen trigger hyperproliferation of the parietal epithelial cells.82 At later stages, the parietal epithelial cells lose their polarity and produce matrix all around themselves, which creates honeycomb matrix deposits in Bowman’s space that turn cellular crescents into fibrocellular crescents with glomerulosclerosis, also referred to as class VI LN. Steroids, cyclophosphamide, azathioprine, and mycophenolate mofetil remain first-line therapeutics for treatment of LN. These nonselective immunosuppressants have much improved the response rates of acute manifestations and the overall mortality of SLE; however, the long-term outcomes of LN have not further improved during the last 30 years.83 High-dose steroids and cyclophosphamide are frequently associated with severe side effects, and infections contribute to the overall mortality in SLE. The same applies to the other nonselective immunosuppressants. For example, in the ALMS (Apreva Lupus Management) trial, infection-related mortality was even higher in patients treated with mycophenolate mofetil than in the group treated with high-dose cyclophosphamide. Reducing the drug dose was the first strategy to limit side effects, and some researchers wonder whether oral cyclophosphamide therapy is no longer needed.84 In addition, some studies suggest that Caucasian patients may no longer need high-dose cyclophosphamide, because the Euro-Lupus trial demonstrated favorable long-term outcomes with much lower doses of cyclophosphamide.85 Other immunosuppressants like dihydroorotate dehydrogenase inhibitors add to the current choices but are still nonspecific.86,87 However, lupus drug developers continue to search for new drugs that more specifically modulate the aberrant immunity in SLE with fewer side effects. Dendritic cell–T cell interaction is a target of costimulatory ligand/receptor blockers such as CTLA-4-Ig (abatacept). This drug blocks the interaction of CD80 and CD86 on antigen-presenting cells with CD28 on T cells, which suppresses T cell activation.95 Abatacept suppressed lupus in mice but did not prevent flares in SLE patients.96 Three trials with anti-CD40L failed to demonstrate efficacy. Abetimus is a drug that modulates autoimmunity by altering antigen recognition by T cells. Abetimus is composed of a series of linked oligonucleotides, which block the binding of anti-dsDNA antibodies to their autoimmune targets and tolerize B cells with antigen specificity for DNA. Unfortunately, the results in clinical trials have been very modest. A similar approach is followed by edratide, a peptide derived from the antigen-binding region of a human monoclonal anti-dsDNA antibody. It has been proposed that this molecule can modulate the function of DNA-reactive B cells through idiotype–anti-idiotype interactions but again, the convincing data on efficacy are still lacking. The concept of anti-dsDNA–specific therapeutic interventions is no longer preferred because it targets only a very small subset of B cells, and no longer seems sufficient in view of the failing B cell depletion trials and the fact that dsDNA antibodies certainly contribute to SLE but remain only one of many different pathogenic elements. Finally, plasma cells now appear as an attractive therapeutic target in SLE because they harbor the long-term memory of humoral immunity and produce the lupus autoantibodies.97 Rituximab does not deplete plasma cells, because these are negative for CD20.97 Massive antibody production in plasma cells involves the intracellular proteasome complex for protein processing. The proteasome inhibitor bortezomib was proven to be effective in mouse models of LN,98,99 but clinical trials with bortezomib in human LN is still pending. The pathogenesis of LN involves extrarenal and intrarenal pathogenic mechanisms. The extrarenal factors include complex combinations of genetic variants that are different in each patient, which explains the variability of clinical manifestations. SLE develops when genetic variants compromise those mechanisms that normally assure immune tolerance for nuclear autoantigens. Loss of tolerance becomes clinically evident by the presence of antinuclear antibodies. The nucleic acid content of nuclear particles from netting or apoptotic neutrophils activates innate and adaptive immunity by TLR7 and TLR9, which triggers an IFN-α–mediated antiviral host defense program that accounts for many of the nonspecific SLE symptoms. As such, dendritic cells, T helper cells, B cells, and plasma cells all contribute to the aberrant polyclonal autoimmunity. The intrarenal etiology of LN involves antibody binding to intrarenal nuclear autoantigens, local complement, and FcR activation. Tertiary lymph follicles, to some degree, form inside the kidney, which include B cells with local proinflammatory effects as well as plasma cells that secrete autoantibody inside the kidney. These insights into the pathogenesis of lupus provide the rationale for a number of novel therapeutic targets. This work was supported by the German Research Foundation (grants AN372/11-1 and GRK 1202).